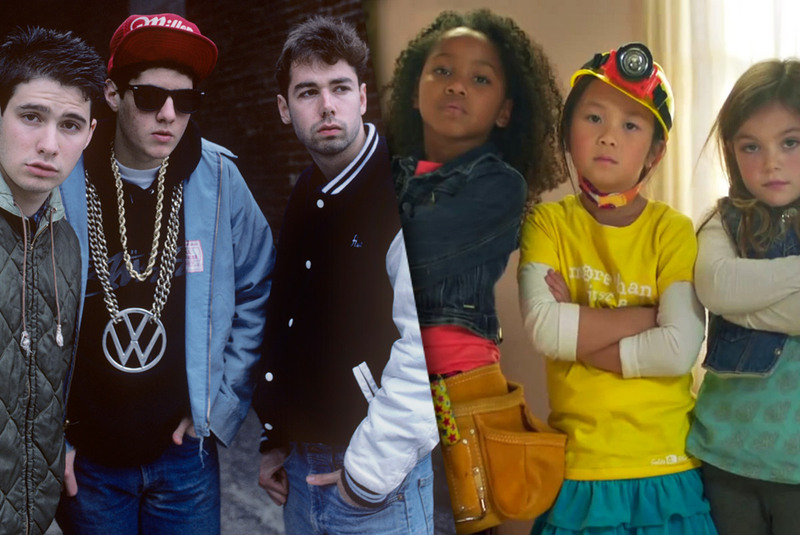 How the Beastie Boys helped this little girl grow up to be a scientist. Description of new GoldieBlox kit from the GoldieBlox website. When the hundredth person sent me a link to the GoldieBlox Girls video I painfully cringed at the Beastie Boys “parody” and wished it hadn’t been an advertisement for a toy and just a public service announcement to energize young girls. When the first story broke that the Beastie Boys were suing GoldieBlox I took a moment to ponder what to do with this incredible clash between a lifelong love and a career passion. 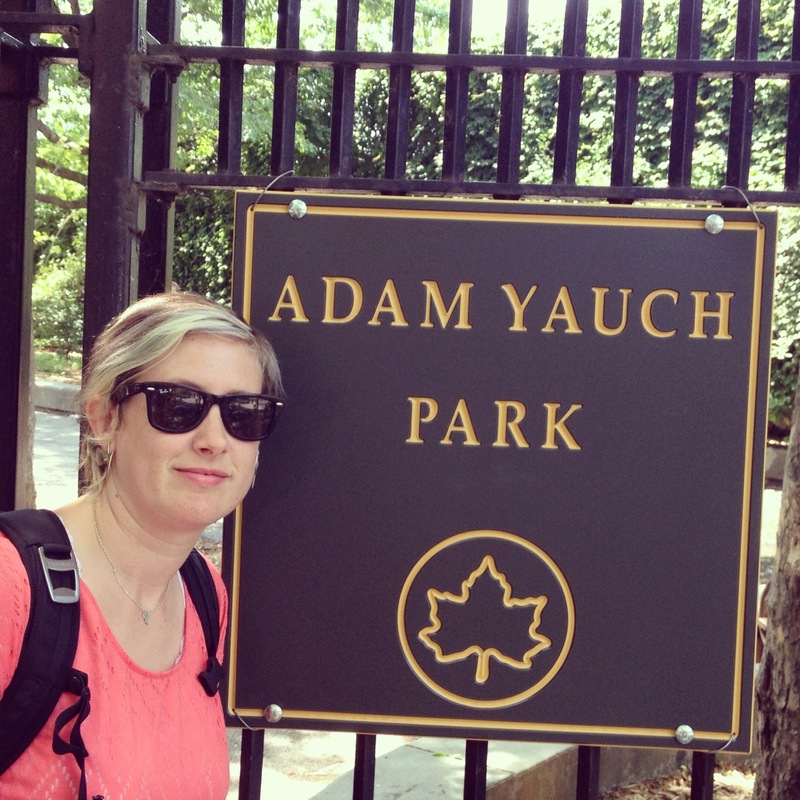 I held out judgment hoping the story would turn around because I just could not believe that the Beastie Boys would make that move. It appears I was right. That being said, this post is not a legal or ethical analysis of this situation. My background is in science and I have absolutely no legal training. I’ve read as much as I can tolerate regarding Fair Use laws. I actually don’t even care anymore. What I do care about is the fact that the GoldieBlox toys are not actually worth the hype and young girls would learn a lot more from cranking the volume on a few Beastie Boys albums and building, hacking and tinkering. 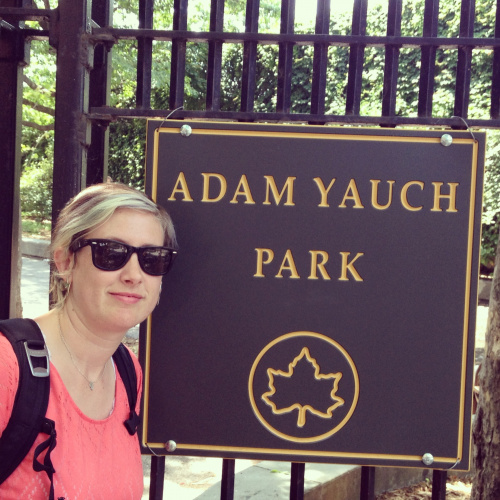 Forcing a smile for the camera while visiting Adam Yauch Park in Brooklyn. Go out to your garage or your local hackerspace and let them build things, let them hack, tinker, create and customize. Let them fail and rebuild. Take that $30 and spend it at your local hardware store or art store. 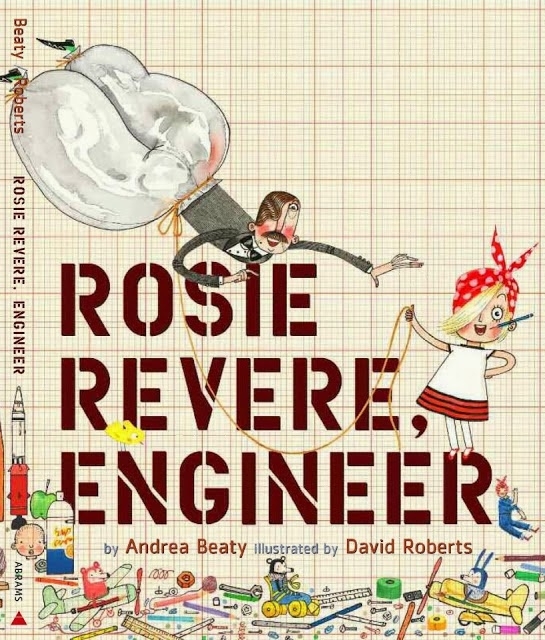 Buy Rosie Revere, Engineer and read it to your daughter and her friends. Pick one of the thousands of tutorials that are out there and go build something together. Help a young girl build her prototype of a better injection system for helping to vaccinate people in underprivileged areas or a solar-powered clinic that can be set up after natural disasters. Find old milk crates and build emergency veterinary hospitals or find cardboard and build structures to launch rockets and spaceships. Help them identify mentors and idols and don’t worry too much if it’s not Marie Skłodowska-Curie or Grace Murray Hopper right now – that may come in time. Let them wear weird outfits and dye their hair and listen to music that hurts your ears. Let them wear princess dresses out to Home Depot to buy materials to build a fort. Let them explore things and give them the room to change and grow. Just like the Beasties put it in Pass the Mic, encourage them to be true to themselves and they will never fall. Girl Scout Troop 73265 Visits SparkFun! I'm worried about pushing the other way. You can buy into a stereotype both ways - by saying it is only worth doing if men do it, or by saying only of men are doing it, it is worth doing. My grandmother could look at you can cut out a pattern which you could sew and it would fit perfectly. No credit since 3D CAD programs hadn't been invented yet. My Mother similarly had various engineering skills (as well as my father, I get my maker creativity from both sides). She did the family taxes, but no credit since she didn't have a degree and a CPA. Well my father didn't have a degree either but he was a mechanical genius - he could fabricate and fix anything and was the go-to guy - skilled trades union - that would fix the engineer's screw-ups. My father was athletic and I inherited his build but not his passion. Instead of throwing balls, I was reading anything on math and science I could get my hands on. But they encouraged it. If you are sending the message to young girls that being a mommy is unrewarding, and wouldn't you rather build skyscrapers or design electronics or program computers - much more exciting! you are pushing her into a pigeon hole as much as anyone trying to push her into a traditional role pigeon hole. We also need fashion designers and people who take care of clothes (Tailors) and people who can engineer healthy and tasty meals (Chefs). And musicians. Push just enough for her (or him!) to discover her talents and passions. But not so hard as to set an expectation or say only some thigns are valued. All human beings are valuable. Because of what they are, not based on what they do or can do. I couldn't agree more. I think the goal is to get young women (and, really, all children) to explore all different areas so they have more data from which to choose a career or lifelong passion. My personal goal isn't even to ensure that the statistics of women in these fields improve (though that would be nice), it's to make sure that young women aren't intimidated by anything. For me, it's about confidence and a lot of what we see with young women playing with electronics and other scientific explorations is that it builds confidence. The same could easily be said for art, music, dance, culinary arts and trade skills. In the 21st century though we feel compelled to do what we can to give the youth the knowledge and skills to fix the balance between being consumers and producers. I like to imagine the possibilities of children growing up with programming and hardware skills and then taking them into the arts, medicine and other non-engineering specific fields. The number of engineering degrees is not the metric I'm looking for with any of this. I'm hopeful for building skill sets and confidence to go after whatever excites and inspires them. As a father of 2 beautiful little girls, I was immediately impressed with GoldieBlox. Not only because it was a way to encourage young girls to invent, but because it was a way for all young children to learn about engineering. I would like to hear more about your opinion on the product. How was it disappointing and underwhelming? From what you wrote it seems more the gender issues that disappointed you. Other than that, I agree with you, letting our children to become themselves is important, and it's amazing how much they try to be like us. Great Post, Thanks! I really liked reading your comment and I was disappointed by many of the other comments other people made. I am also a father of a young daughter. My daughter received the GoldieBlox and the Spinning Machine kit when she just turned 4 years old. She loved it. She still plays with it weekly, 3 months later. My daughter also has many other building type toys along with a princess castle, dress up butterfly wings, trains, cars, etc... I work in the computer field and my wife received a Civil Engineering degree and later while working received her PE license, however my wife is now a stay at home mom and loves it. An interesting thing happened a month ago. My daughter's fraternal twin cousins, 1 boy and 1 girl that just turned 3, were over and my daughter wanted to get Goldie Blocks out. My wife, ever wanting to get kids a chance at tinkering and building, got all 3 kids together. They got all the parts out and my wife started to read through the book (story/instructions/guide). The two girls were highly attentive. The boy ignored the story and just jumped in to the parts. However, he quickly gave up and moved on to some other toy. Both girls played and played with the Goldie Block. The story about a girl building things really helped pulled the girls in. The two girls talked about it all day in the way little kids talk. Some other thoughts on the Goldie Blocks product. I think they should move the beginning age down to 3, but it is probably more around the choking hazard issue on why it starts at 4 is my guess. I highly doubt my daughter will be playing with it in a couple years from now as a stand along toy. I think she is likely to use the parts in something else she builds though. Just some observations with the GoldieBlox toys, from three kids and two parents. Take from it what you will. What ever keeps the kids learning and growing is the key. I'm actually glad to hear that your girls enjoyed interacting with GoldieBlox! Admittedly, my interactions with GoldieBlox are as an adult and only with the first kit they they released. I did not find the learning experience to be particularly great and my background is actually in molecular biology, so I have plenty to learn in terms of engineering principles. I thought the kit/toy missed the mark - the stories and hands-on experiences did not particularly enhance my understanding or interest in engineering. That being said, I'm an n of 1. It did, however, get me thinking about the bigger issue at hand and how to tackle it. I absolutely love the idea of exposing more children (especially young women) to science and engineering and I don't think there will be a silver bullet for reaching large swaths of the population. We need options. I am hopeful that GoldieBlox is just the beginning of a growing trend and that future iterations will improve upon it. I'm a member of an FRC robotics team. Our non-technical division wrote a book entitled "Lily the Learner", a short story targeted at children interested in becoming engineers. It highlights the interesting points about being an engineer and talks about a few of the many disciplines of engineering. Your post made me think of it. It's very important that we introduce engineering to children while they are still thinking about what they want to be when they grow up. Given my work as an educator, social entrepreneur, and STEAM curriculum designer, I greatly appreciate this post. With regard to the comment below from tz, who expresses concern about pushing girls too far beyond traditional gender stereotypes, saying, ". . . we need fashion designers . . . " I have two points of fact. 1. Fashion designers employ science, technology, engineering and math on the job every day. I've written a curriculum on the bread-and-butter science and math of fashion design for middle school students --- girls and boys. 2. Let's rise above engendering a given occupation. The point is not that being a stay-at-home mom is not valuable. The point is that females, as with males, need to be literate and competent in all subjects so they are able to make a genuinely informed decision about their career and life paths. Given 21st century on-the-job demands, the path of least math is no longer an option. Gender stereotypes about who does what need to be laid to rest. Heidi A. Olinger CEO, Pretty Brainy, Inc. I am going to stick with LEGO bricks. You can build very nearly anything. I was unaware of this controversy until I read this article, so I had to do a little research to figure out exactly what the Beastie Boys complaint was all about. Forgive me if I'm wrong, but it sounds to me like GoldieBlox produced a parody song and pre-emptively sued Beastie Boys for the right to show a parody? That sounds to me like the whole point was to gin up publicity in the hopes that the video would go viral, right? I don't like how copyright law is abused by the music industry, but I also really hate fake controversies being created in order to get publicity. A parody in support of a commercial product - not exactly fair use. After BB inquired* about GB usage, GB preemptively sued BB to force the copyright determination. My wife picked up the first one for our four year old daughter at Christmas. To say I was disappointed would be a serious understatement. Although the box gives an age range of 4 to 9, 4 to 4.5 would be more appropriate. The kit is so limited that after playing with it two or three times she cast it aside and moved back to the big tub or brick, cogs and other assorted pieces to build contraptions. I can't imagine an older kid lasting more than five minutes before exhausting the possibilities. Marie Curie? Of course you mean Marie SkÅodowska-Curie as this was her name. Please don't repeat this mistake! Thank you for the correction! I revised the blog accordingly! I wrote about the learning issues and claims of giving "voice" to girls via the GoldieBlox ad blitz a few months ago here - http://stager.tv/blog/?p=3158 "Voice is Cheap"
As for role models and female pioneers worthy of attention, please check out this article - http://constructingmodernknowledge.com/cmk08/?p=1967 "Time to Honor a Technology Pioneer!" 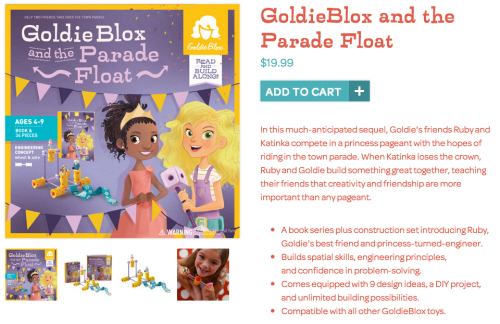 I recall reading your article when I first sat down to write my thoughts on GoldieBlox. You're spot on! In the end, it's just brilliant marketing and not much beyond that. Hopefully better options will come along! My eight year old received this for Christmas. We both agree with your assessment and would add that the materials are cheaply made and don't lock together the way Legos do. Now, give her some lilypad LEDs and conductive thread and she will make you a stuffed Domo that lights up. We have been happy with all products from Sparkfun in terms of value and quality. I agree, I wasn't impressed with this set, I really don't see much difference between it and Legos. Nothing ot inspire, just follow directions. However You didn't really state what you didn't like. You're right - I did add a comment earlier (see below) that gets to that point a bit more. Overall, I just didn't feel like that toy added anything to the landscape for learning about engineering. Neither the stories nor the activities were particularly engaging. It didn't live up to the hype and I do take issue with some of the gender ideals in the marketing. I don't think pink or purple are the issue - I have no issue with young girls having an affinity for pinks and purples. It's also weird that they talk about taking over the aisles of pinks and purples yet the branding has plenty of that and even incorporates beauty pageants. There's some conflict there. I think this was really a marketing project rather than a truly thought out toy/kit for engaging young girls. The LEGO Friends series has some of the same flaws. I would never have wanted the Friends series (though I do understand that many young girls do) and preferred the good ol' fashioned primary color cubes. I loved that the blocks were a raw material for the imagination and am saddened by how much the toy industry has migrated toward specific kits with seemingly end-product single use. I felt the same way about the Lego Friends series when we started getting it for our girls, but now that the boxes are gone and the pieces are all mixed up they are spontaneously building different things. We've had a box of generic lego for years and it just didn't stick; having the characters made the difference. 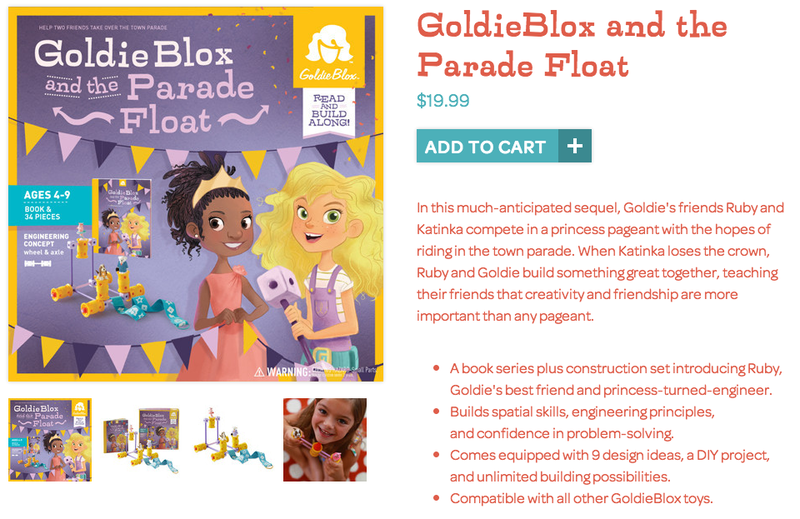 I'll admit I was underwhelmed by GoldieBlox as well, but I think the concept is sound and it just needs to be built out more. My girls want to create stories and for that it helps if there are characters, so GoldieBlox, while not a constant play toy, gets enough use that those different brain cells are lighting up. When they're older I'll be pushing the wearable electronics, they don't care about robots. It's about finding the point of interest that can be built on, which is the strength of GoldieBlox, Lego Friends, flashing tiaras etc. Jazz Myn? Is that seriously your daughters name? If so, I think it's a stroke of genius. I love it!! My two daughters are just starting to show an interest in building and hacking stuff. Of course, my 7-year-old's idea for a first project is to build a Theremin. We'll see how that goes. We're working with an arduino and an OpenTheremin.The 9-year-old is working on her Halloween costume and will be integrating a LilyPad and LEDs. I'm going to point them both to Jazz's YouTube page. Tell her to keep up the good work! Thank you for sharing! I'm male, no kids (or siblings, for that matter), and of the "Beatles generation" rather than "Beastie Boys generation", so it's interesting for me. I often think that the NCIS character Abby is a great role model. She's the main reason I watch NCIS. I'd like to suggest another albeit nontechnical resource for both girls and boys: mensaforkids.org (and yes, I'm a Mensa member). Oh, I should mention that anyone is welcome to use mensaforkids.org, not just members or their kids. I was somewhat disappointed with the limited scope of the first GoldieBlox toy, but my 5 year old daughter was not. It's not a good fit for all girls, certainly, but it seems to me like 95% of their target demographic (4-9yo girls) are into princesses and pink everything. And my daughter likes that it's unarguably her toy and that her older brother has to ask to play with it.